A fun way to engage your visitors. Our new widget (Wheel of Fortune) is based on the Reciprocity effect. Within the study of the psychology of relationships reciprocity is a principle, which speaks to the human need (and tendency) to want to give something back when something is received. This is what our Spinner is all about. A visually stunning tool to help you engage your visitors! Our latest widget, is a visually stunning tool that will enable much greater engagement in your website than all our other standardized widgets. The main concept behind it, is based on the give and take relationship. You offer to your visitors the chance to win a gift via an interactive and fun game and in return they give you their contact info and engage with your website. Help you increase your customer base by capturing email addresses of the visitors. It adds an extra flair to your website due to its wonderful design. You can customize the widget and offer anything you wish, may that be a random article picker, or a free PDF. Use your creativity! Run a competition. Give various gifts to your vistirs. Ask them to add their e-mail and after a draw pick the winner! Help your e-Shop convert! Give promo code giveaways to customers. That could be 10% off, 20% off etc. Make sure your promo codes expire after a short period so that you trigger the sense of urgency and boost conversions! Think of various ways to engage your customers. Provide a random gift, or a random e-book giveaway. Create a wheel of fortune and commuicate your top articles. By providing promo codes or gifts. Promote your TOP content in a creative way. Provide useful E-books of your industry. 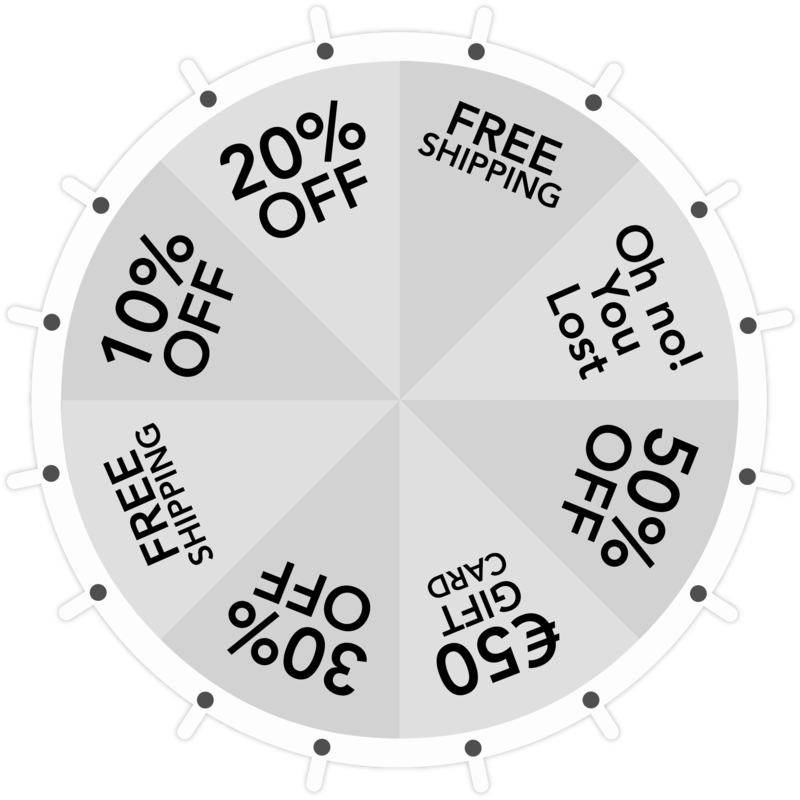 Wheel & Win is a fun and playful way to receive gifts such as discounts, or free shipping, to name a few. Taking into account the fun factor that a gamified widget offers, it provides a great non-intrusive tool in your hands that does not annoy your visitors. Moreover it provides a more interactive and fun shopping experience for the customer. Furthermore, it increases customer engagement, which has a direct impact on your sales. When a visitor of your website is confronted by a standardized pop-up the most likely scenario is that the pop-up is going to get ignored (when compared to the Wheel of Fortune). The constant use of them in almost every website has made visitors quite indifferent and thus the engagement is becoming lower. On the other hand when visitors are confronted by Spin the Wheel & Win, they feel they have the chance to win something big, let alone that they appreciate more their eventual gift than a typical sign up for a free book pop-up. Can I change the number of Segments of the Wheel? YES YOU CAN! You can choose from 2 up to 16 segments. You can do that via the Workbench of Appocalypsis. Can I try the Wheel of Fortune for FREE? Certainly! You can sign up for the FREE plan (which is up to 10K pageviews per month). Does it work on any Website? The Wheel of Fortune is engineered to work with any website and platform. You simply have to copy and paste the Appocalypsis code snippet on your website and that is all! If a visitor comes to my website again, will they see the Widget again? That is up to you to decide. If you wish then the answer is yes! However we do not recommend showing the widget to visitors more than 2 times. You can also configure the widget to stop showing if a visitor already used it. I do not have any technical skills. Can i create a Widget like that easily? No technical skills are required to use Appocalypsis. All you need is your Imagination. Create one in 5 minutes!